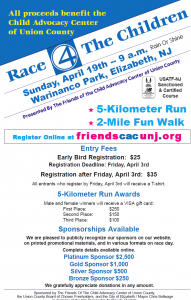 The Friends of the Union County Child Advocacy Center – a nonprofit group whose mission is to provide support for the facility at which local victims of physical and sexual child abuse receive treatment and needed services – is hosting a 5K fundraiser, Race 4 the Children, on Sunday, April 19 in Elizabeth’s Warinanco Park. The 5K and a two-mile “fun walk” are scheduled to begin at 9 a.m., rain or shine. The event is being co-sponsored by the Union County Board of Chosen Freeholders and the City of Elizabeth, in memory of late Union County Prosecutor Andrew K. Ruotolo, who served from 1991 until his death in 1995. Funding for a psychologist to be stationed at the Center previously had been covered by grants that are no longer available, according to Friends of the Union County Child Advocacy Center Chairman Drew Ertman, who added that the 5K was organized in an effort to secure replacement funding. Those interested in participating can register online at www.friendscacunj.org; the cost to register is $25 up until April 3 and $35 thereafter. All entrants who register early will receive a T-shirt commemorating the race, while male and female first-, second-, and third-place finishers of the 5K will receive Visa gift cards valued at $250, $150, and $100, respectively. Sponsorships are also available for purchase, and all sponsors will be recognized on the nonprofit group’s website, on printed promotional materials, and in various other formats on the day of the race. The Union County Child Advocacy Center is located on West Jersey Street in downtown Elizabeth. Nearly 30 staff members work at the 11,000-square foot facility that opened in 2012, tending to the more than 1,100 people who visit and utilize the Center’s resources each year. The “one-stop” service facility houses prosecutors, detectives, child protection workers, nurses, physicians, and therapists who work with children of Union County who have been sexually and/or physically abused. At the Center, these children disclose the details of abuse in a friendly environment where each child and family member receives appropriate referrals for medical and psychological follow-up treatment. A therapist from Trinitas Regional Medical Center’s Child and Adolescent Outpatient Psychiatric Unit meets with each family following disclosure to perform crisis counseling, stabilize the family, and make future counseling recommendations. Finally, an Assistant Prosecutor then begins the two-year process of shepherding each family’s case through criminal litigation. A social worker also coordinates additional medical, child protective, and psychological services for each family.